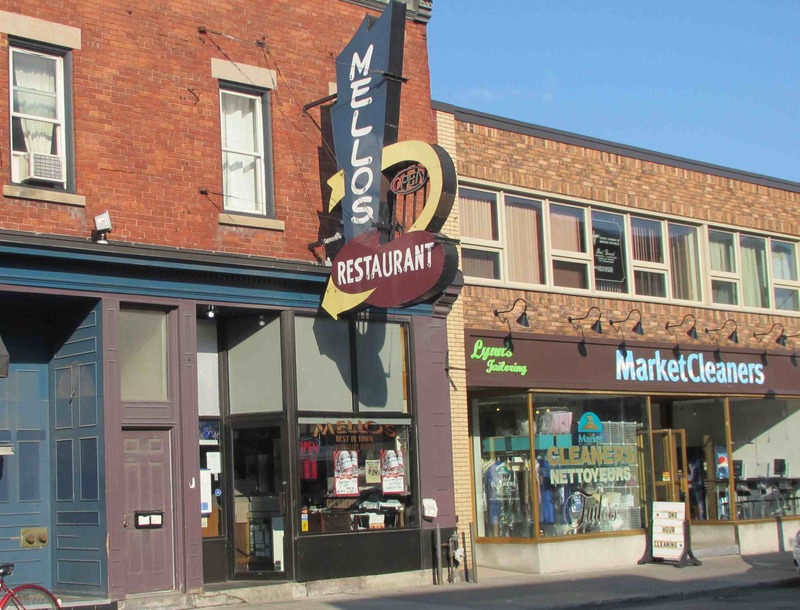 Mellos is a bit of a hole-in-the-wall type of establishment. It is shotgun-narrow and seats about 30 or 40 people at maximum capacity. There is very little in the way of decoration, save for some very nice photographs of Ottawa circa 1920 or so, and the walls are a rather drab gray. It is a bit scruffy, and the ambience is not helped by the unrestricted review into the dishwashing area. Still, it is not without a certain charm and the newspapers lying around, which seemed a bit messy and sloppy at first, are obvious left there for the use of patrons. It wasn’t until I had been in the place for fifteen minutes or so before I realized that the source of the stand-offish reception was the fact that I had taken several photographs after sitting down and then made some notes on my I-pad. Usually, I try to do this as unobtrusively as possible in restaurants but, even when I do get noticed, it usually arouses no more than a mild curiosity. On this occasion however, my photography seemed to spark a reaction of immediate suspicion and one of the waitresses eventually wondered aloud to the other (but clearly for my benefit) whether I was ‘making some kind of report’. She eventually asked me what I was doing and when I told her (with admittedly incomplete honesty) that I would be sending the pictures to my wife, she immediately mellowed and the atmosphere became distinctly warmer. She asked me where I was from and, when I told her Nunavut, she and her colleague expressed obvious interest and asked quite a few questions. After that, the remainder of the meal and the service was very pleasant and welcoming. The breakfast menu is very short and simple, with all the standard sorts of combinations and few frills. Beyond the items you can see in the picture above, one can also order a variety of sides such as home fries, toast, bagels and baked beans. 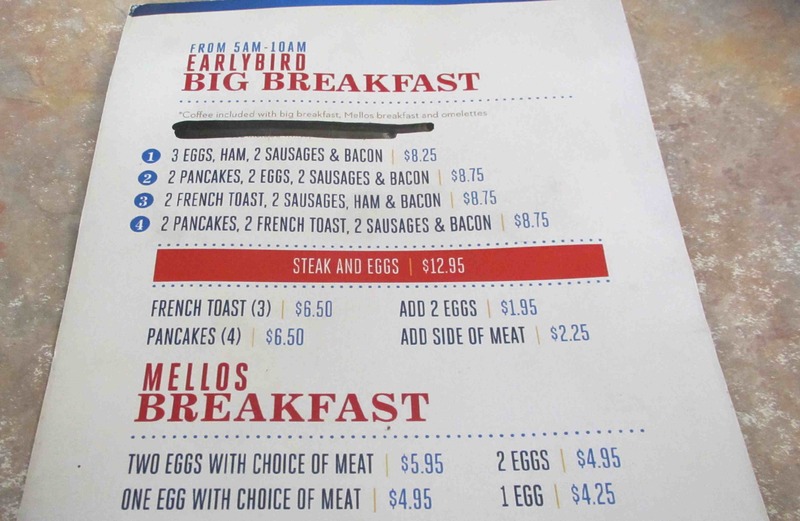 The most expensive item appears to have been the steak and eggs, which comes in at a pretty reasonable $12.95. I didn’t see any other menu, but one of the desk-clerks at ‘Les Suites’ hotel told me that the place has a new cook and that it is well worthwhile trying the place in the evenings as well. I opted for one egg scrambled with ham, sausage, and home fries. With coffee and toast, the whole meal was under nine dollars and was quite decent for the price. 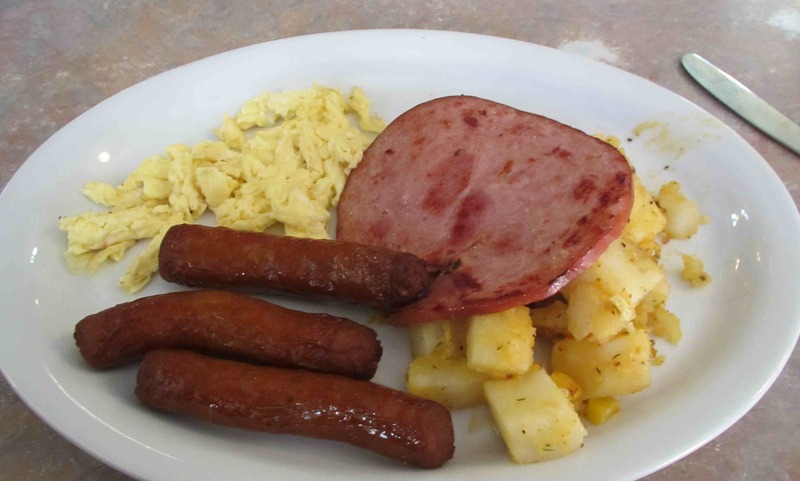 The ham, egg and sausage were unremarkable but the potatoes were very nice. They didn’t have the heavy garlic-salt taste one often gets and I rather think that the very delicate and tasty seasoning might have been a proprietary blend. Thanks for sharing your story. Your review is also fair. I like your conclusion. It is simple …indeed simplicity is a plus! You are quite a bit less conspicous taking food pictures when you are with someone rather than eating alone, as I was on this occasion. It’s funy that this is really the only time I have exerienced any sort of significant reaction photographing food in resturants. That’s good advice. Taking photos of your own plate is okay but asking for premission to take a pic of the interior is probably a good idea. 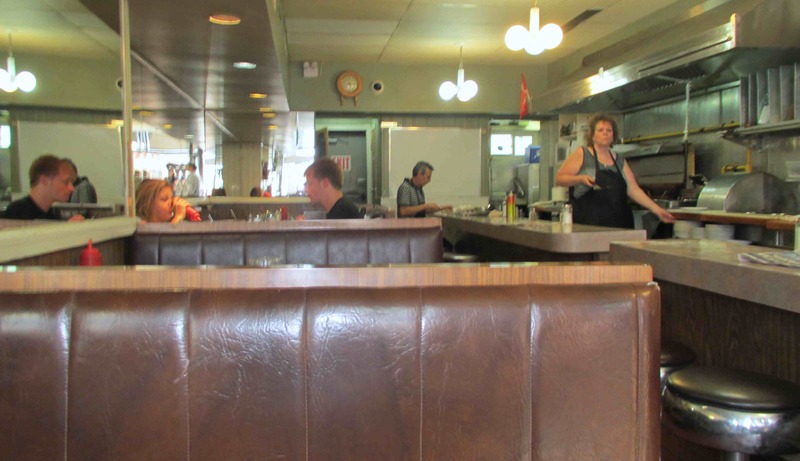 I have adopted the ‘cover’ story so that if I am asked (while alone), I can say that my wife and I always e-mail each other pictures of places we eat. I don’t want to say it is for a blog otherwise you may ‘influence’ how you get served. We all find places that are OK but finding memorable restaurants seems to be getting harder. By food prices in New England, the price is high for breakfast. Really? I’m surprised actually…. it seemd quite reasonable to me even given my northern perspective! I’m sure that your northern perspective definitely makes a difference. Where I live, you could get that meal for $5.99 U.S and it might come with a side of pancakes. But you know what they say, it is all relative. Pretty much… in a hotel restaurant in the arctic… were there would be little other choice… the same meal might easily run you $20 – $25 … and you would likely have to make your own toast. I didn’t actually get called ‘honey’ by the waitresses but apparently it happens!